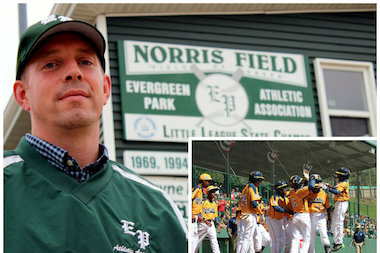 CHICAGO — The suburban little league coach who first accused the Jackie Robinson West little league team of cheating in 2014 filed a lawsuit Monday against Little League International, citing "severe emotional distress" he's suffered since blowing the whistle on the organization's cover-up. Chris Janes had coached a little league team in Evergreen Park in 2014, the same year the South Side elementary school beat a Las Vegas-based team to win the U.S. Little League Championship. Later that year, Janes filed a complaint with Little League International, accusing coaches of breaking residency rules by stacking the lineup with All-Star ringers from the suburbs and elsewhere outside the JRW designated boundaries to create a “super team." Little League International stripped Jackie Robinson West of its national title in February 2015 after determining the claims were true. Janes faced harsh criticism for his decision to break the cheating scandal. An attorney for Jackie Robinson West accused Janes of illegally accessing registration information, and the coach even reported receiving death threats over the phone and on social media. The backlash incurred "severe emotional distress that resulted in depression, anxiety, humiliation, loss of sleep, weight loss and loss of consortium," according to the complaint filed by Janes' attorney. Janes is seeking $75,000 in damages from the organization, according to the lawsuit.